I’m never buying ricotta again. In fact, I’m never buying quark (cream cheese), mascarpone or yoghurt again either. Well, not once I buy a yoghurt maker anyway. 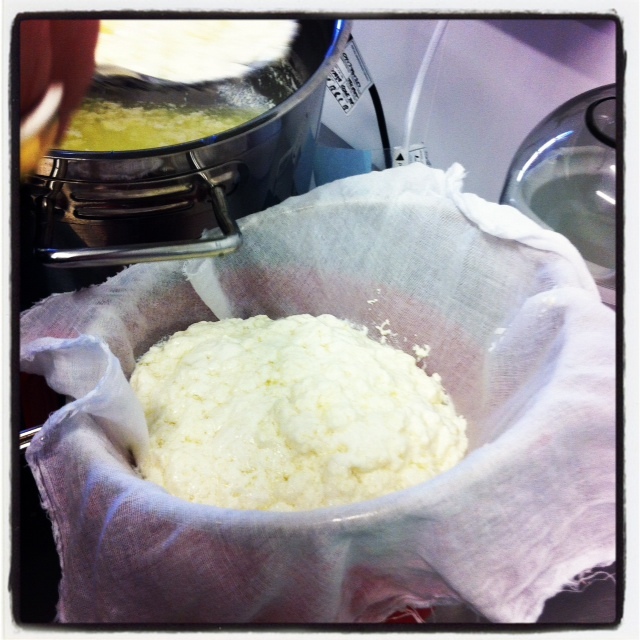 Today hubby and I did a cheese-making workshop. 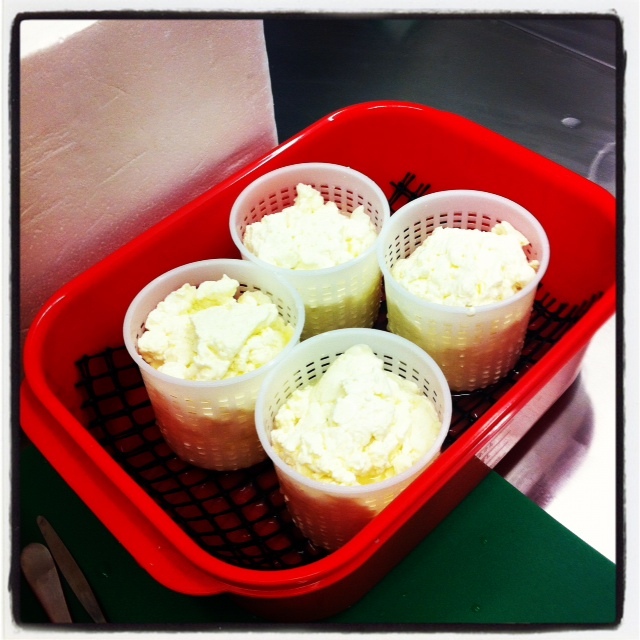 In just one day we learned how to make camembert, feta, ricotta, quark, mascarpone and thick greek style yoghurt. And it was all easy. cultured milk in the “vat” inside the “cave”. 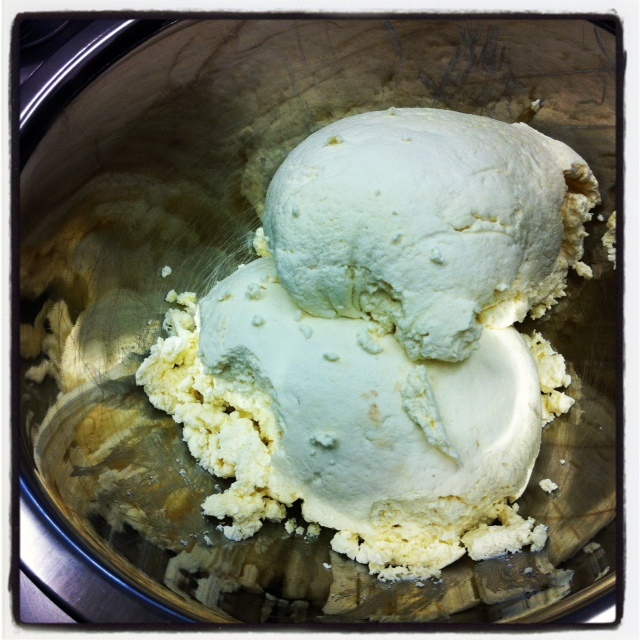 This will become camembert. Naturally as we’re doing things with technical terms like “cutting the curd” and “turning the curd” and “cooking the curd” I had visions of myself as a buxom French farm wife somewhere in Provence producing wheels of camembert amongst fresh lavender. Then I switched to being a buxom Italian wife somewhere in Tuscany making cubes of feta and marinating them in olive oil (naturally produced on the farm) scented with rosemary and garlic (also grown on the farm). Then I decided that the lifestyle would mean I couldn’t travel so switched instead to a fantasy whereby I was turning out jars of marinated feta for Christmas presents. 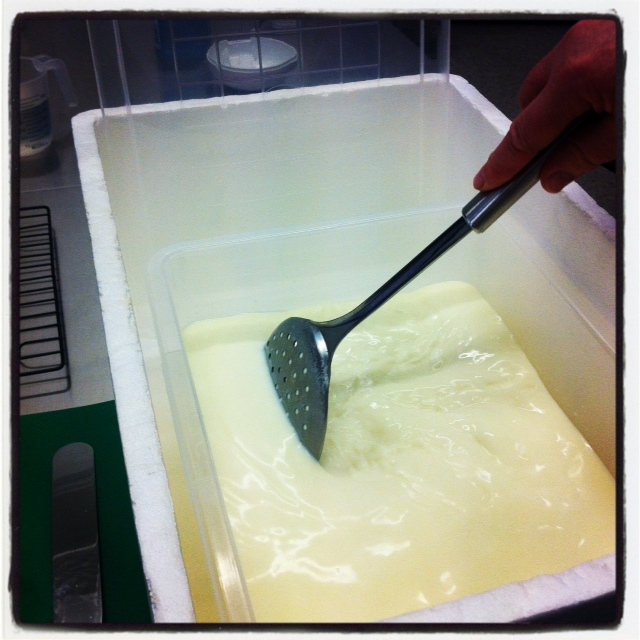 turning the curd. This will become camembert. 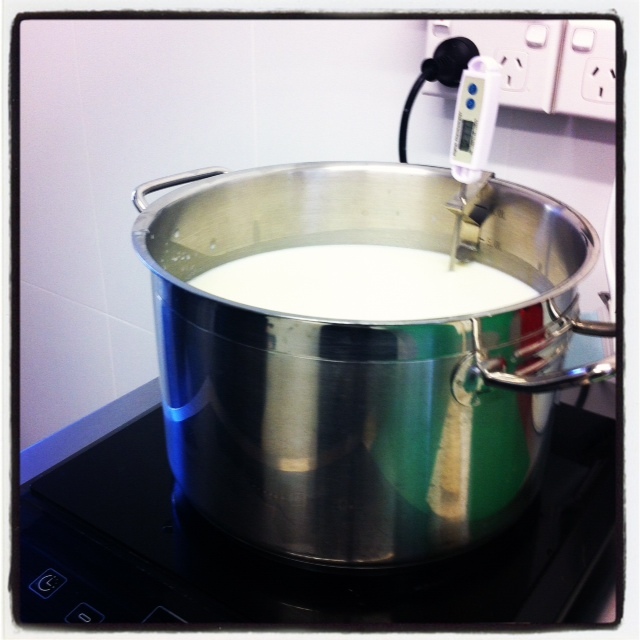 The thing about the Cheese-making Workshop is you don’t need a lot of fancy equipment. My romantic ideas of an underground cheese cave and huge stainless steel vats have been dashed. A polysterene box to act as a “cheese cave”, a 10ltr plastic container, a thermometer and a couple of jugs and slotted spoons are about as sophisticated as the equipment gets. The cultures and rennets can all be purchased through the store- in fact everything can be purchased through the workshop. 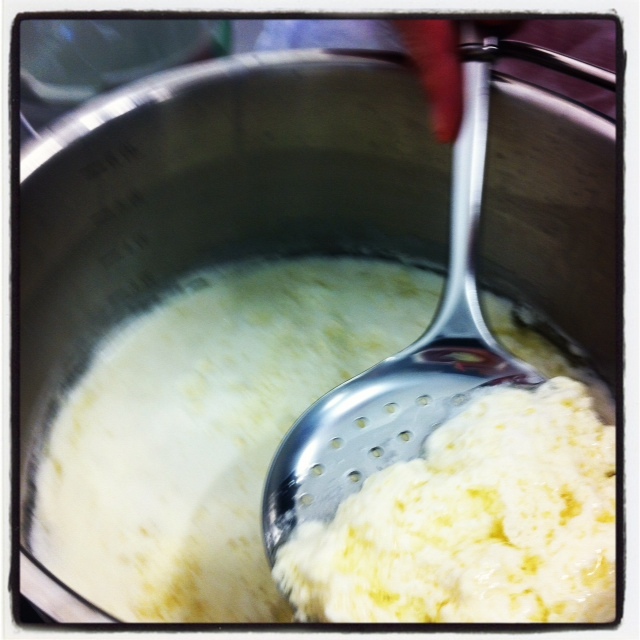 All you need for ricotta, other than milk, is white vinegar. Seriously. As I said, I’m never buying it again. 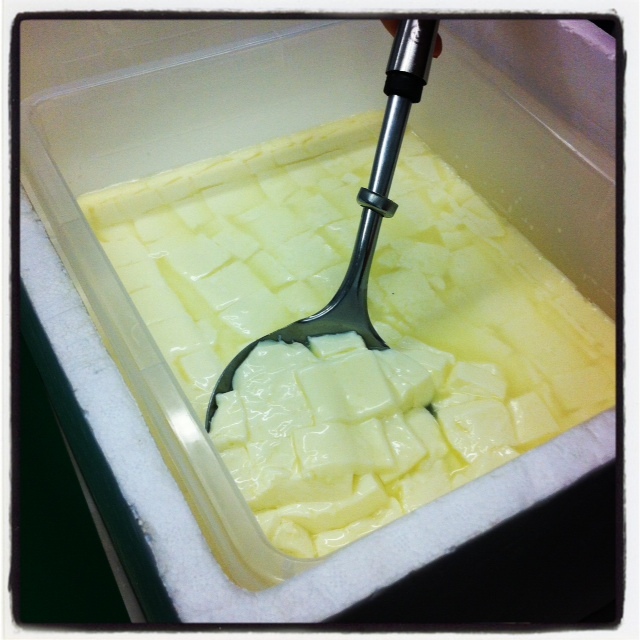 The Cheese-Making Workshop is based at 292 Sailors Bay Rd, Northbridge, but they also operate on the Coffs Coast and have mobile workshops as well. 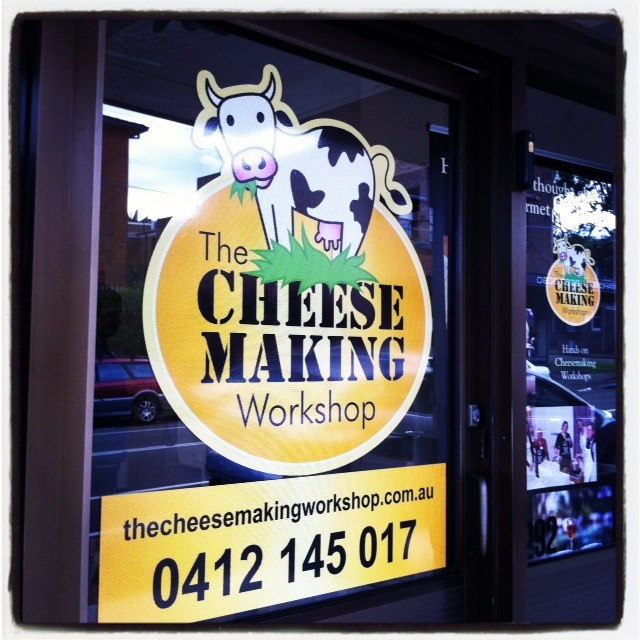 Check out the website for details at http://www.thecheesemakingworkshop.com.au. $175pp and represents excellent value. Gift vouchers are available. We picked our vouchers up through LivingSocial. 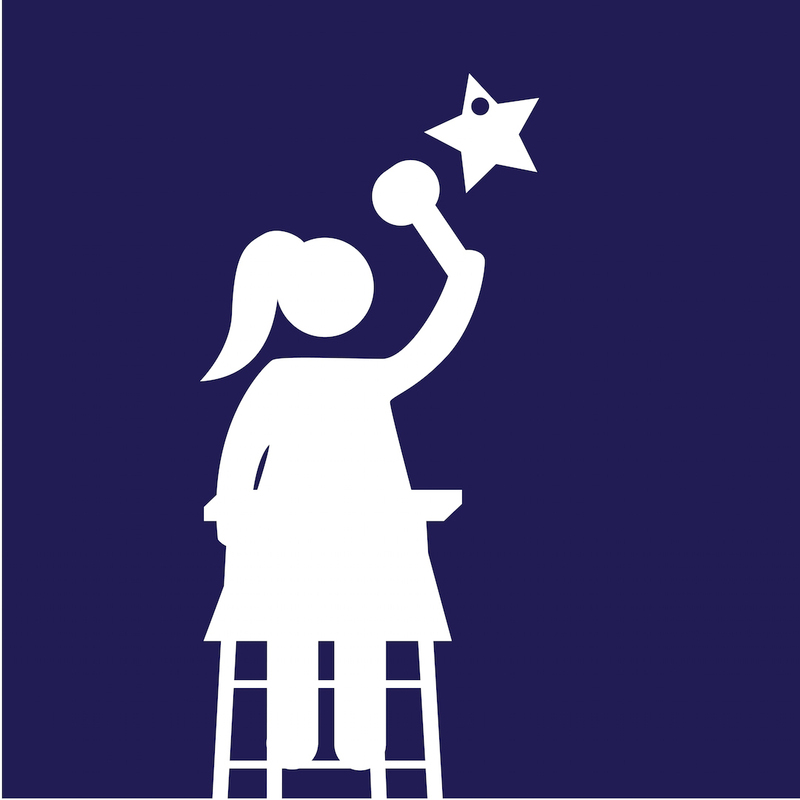 The class runs from 10am-4pm and is completely interactive. You are making the cheese. Included in your price is morning tea, lunch and chees tastings. For morning tea we had yummy cheesecakes made from quark and mascarpone with a side of vanilla scented mascarpone and yoghurt, plus a cheese tasting plate. Lunch was ricotta (the one we had just made- I’m never buying it again) and spinach cannelloni with a pear, rocket and parmesan salad and a greek salad. We brought home with us a camembert and feta each, a sample of the yoghurt and mascarpone and a rolled quark. Naturally there are also copious notes- including what we need to do to care for our cheesy babies over the next 48 hours (in the case of the feta) and the next 4 weeks (in the case of the camembert). Heat the milk and add the vinegar. Stir. Wow, I assumed cheese (etc) making would be incredibly difficult. I can’t believe you learned so much in a day. 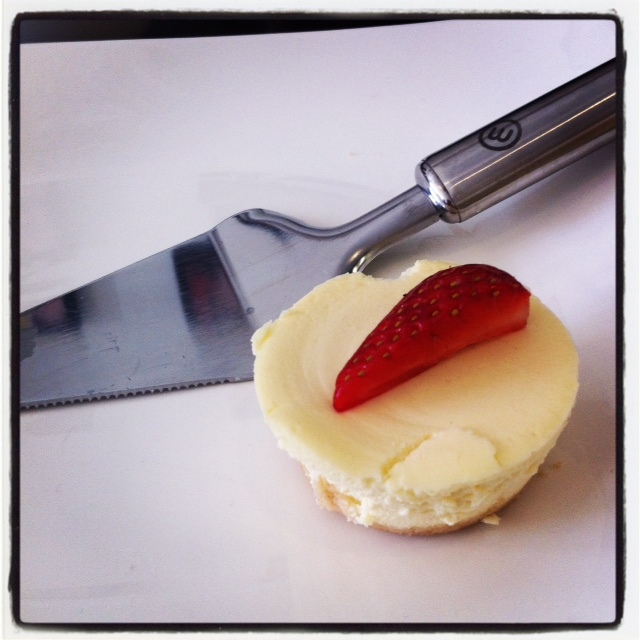 And that cheesecake for morning tea looks heavenly! I thought it would be too. Mind you. when I unveil the finished camembert, there will be bragging rights and a tad more exaggeration over just how clever I must be. Make sure you capture the masterpiece on film!